Dslkjghroebmgn[‘sk’;km…… Oops, looks like the cat walked across the keyboard again! If you’ve got a cat you already know that most cats seem to be mysteriously drawn to the computer keyboard. My own cats have at various times walked across my keyboard, sat atop it, pawed the keys, or just casually rested an arm across it. Unfortunately, in addition to typing random letters and characters my cats are exceptionally skilled at pressing various combinations of keys that create all sorts of havoc on the computer. You might have also noticed that if you’re reading a newspaper or book, your cat will often sit directly on top of your reading material. Your cat craves attention, and when you’re engrossed in another activity such as reading, watching TV or typing on the computer, your cat seeks to gain your attention. Certainly your reaction to your cat’s stroll across the keyboard is proof positive that this activity will quickly gain your attention. And if you think about it, how often does your cat walk across the keyboard when you’re not there? They seem to be drawn to the keyboard exclusively during the times you’re busy working there. 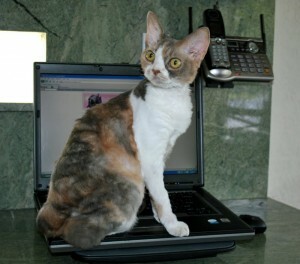 Cats are drawn to the warmth of a laptop computer, as well as to the action of your hands moving across the keyboard. After all, you’re playing with it, it must be fun! The darting cursor, blinking graphics, sounds and motion on the computer monitor all can easily capture a cat’s interest. What’s more, the computer keyboard keys have an enticing “give” and make an interesting clicking sound when your cat walks upon them. If you want to eliminate this behavior, don’t draw your cat’s attention to the computer no matter how entertaining it is to watch your cat paw at the cursor. If possible, try placing a comfy bed next to your keyboard so your cat has an alternate place to sit and still be beside you. You can also try placing your keyboard or laptop on an angled computer stand as the angled surface is not comfy for cat napping. While it might seem as though your cat is just being annoying, you should be flattered that your cat is trying to gain your attention. Make sure your cat gets lots of attention and interactive play time with you so he or she is less likely to seek out your attention when you’re busy on the computer.